Almost all apps will need to store data of some form. Maybe you need to save user preferences, progress in a game, or offline data so your app can work without a network connection. Developers have a lot of options for managing data in iOS apps, from Core Data to cloud based storage, but one elegant and reliable local storage option is SQLite. In this tutorial I will show you how to add SQLite support to your app. You can find the final source code on GitHub. The SQLite library is written in C, and all queries happen as calls to C functions. This makes it challenging to use, as you have to be aware of pointers and data types etc. To help, you can make use of Objective-C or Swift wrappers to serve as an adapter layer. A popular choice is FMDB, an Objective-C wrapper around SQLite. Its easy to use, but personally I prefer to not use hard-coded SQL (Structured Query Language) commands. 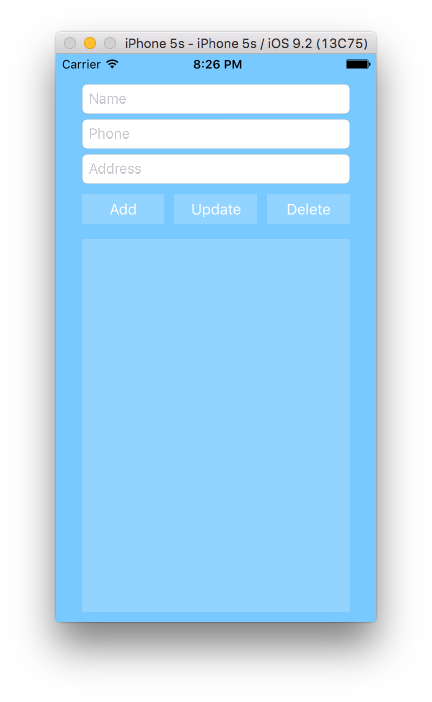 For this tutorial, I will use SQLite.swiftto create a basic contact list. First, create a new single view project in Xcode (SQLite.swift requires Swift 2 and Xcode 7 or greater). I created a ViewController in Main.storyboard that looks like the below. Create your own similar layout, ordownload the storyboard files here. At the bottom is a TableView which will hold the contacts. You can install SQLite.swift with Carthage, CocoaPods, or manually. Create a new Swift file / class named Contact.swift, it contains three properties and initializers to keep it simple. The id is required as a parameter when creating an object, so you can reference it in the database later. 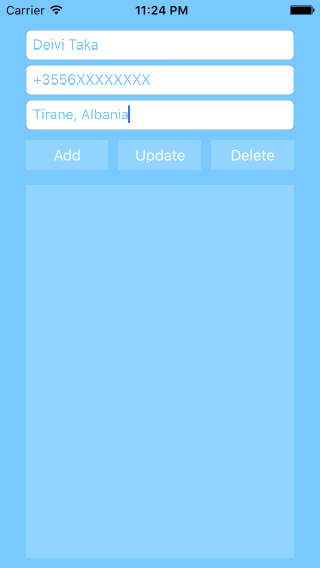 In ViewController.swift make the class implement UITableViewDelegate and UITableViewSourceprotocols. Connect the following IOutlets with their corresponding views by dragging or manually adding them in code. @IBOutlet weak var nameTextField: UITextField! @IBOutlet weak var phoneTextField: UITextField! @IBOutlet weak var addressTextField: UITextField! @IBOutlet weak var contactsTableView: UITableView! Now you will need a list of contacts, and an index for the contact selected from the list. 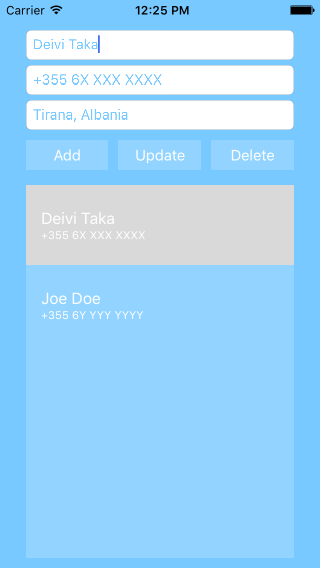 Link the DataSource and Delegate of the UITableView with the UIViewController in the storyboard. Or by adding the following lines into the viewDidLoad() method of ViewController.swift. To insert, update and remove elements from the UITableView you need to implement three basic methods from the protocols mentioned above. The first will fill the UITextFields with the corresponding contact information from a selected contact. Yt will then save the row that represents this contact in the table. The next function tells the UITableViewDataSource how many cells of data it should load. For now, it will be zero since the array is empty. The last function returns a specific UITableViewCell for each row. First get the cell using the identifier, then its child views using their tag. Make sure that the identifiers match your element names. The app can now run, but there is no ability to add or edit contacts yet. To do this link the followingIBActions with the corresponding buttons. let name = nameTextField.text ?? "" let phone = phoneTextField.text ?? "" let address = addressTextField.text ?? "" Here you take the values of the UITextFields, and create an object which is added to the contacts list. The id is set to 0, since you haven’t implemented the database yet. The functioninsertRowsAtIndexPaths() takes as arguments an array of indexes of the rows that will be affected, and the animation to perform with the change. In this function you create a new Contact, and delete and re-insert in the same index of the list to make the replacement. The function doesn’t currently check to see if the data has changed. The last function removes the contact selected and refreshes the table. At this point the application works, but will lose all changes when relaunched. Now time to manage the database. Create a new swift file / class named StephencelisDB.swift and import the SQLite library. First, initialize an instance of the class, using the ‘Singleton’ pattern. Then, declare an object of typeConnection, which is the actual database object you will call. The other declarations are the table of contacts, and its column with a specific type. The constructor tries to open a connection with the database which has a specified name, and a path to the application data, and then creates the tables. Notice there is no SQL code to create the table and columns. This is the power of the wrapper used. With a few lines of code you have the database ready. For those unfamiliar with the term, ‘CRUD’ is an acronym for Create-Read-Update-Delete. Next, add the four methods to the database class that perform these operations. The <- operator assigns values to the corresponding columns as you would in a normal query. The runmethod will execute these queries and statements. The id of the row inserted is returned from the method. If you want to undertake further debugging you can use a method instead. The prepare method returns a list of all the rows in the specified table. You loop through these rows and create an array of Contactobjects with the column content as parameters. If this operation fails, an empty list is returned. For deleting items, find the item with a given id, and remove it from the table. You can delete more than one item at once by filtering results to a certain column value. After setting up the database managing class, there are some remaining changes needed toViewcontroller.swift. First, when the view is loaded get the previously saved contacts. The tableview methods you prepared earlier will display the saved contacts without adding anything else. Inside addButtonClicked, call the method to add a contact to the database. Then update the tableview only if the method returned a valid id. In a similar way, call these methods inside updateButtonClicked and deleteButtonClicked. Run the app and try to perform some actions. Below are two screenshots of how it should look. To update or delete a contact it must first be selected. SQLite is a good choice for working with local data, and is used by many apps and games. Wrappers like SQLite.swift make the implementation easier by avoiding the use of hardcoded SQL queries. If you need to store data in your app and don’t want to have to handle more complex options then SQLite i worth considering.